In the following article we will earn how to build a simple LED chaser circuit with a push pull or reverse forward sequencing effect, and also in the later part of the article we will learn how this simple LED chaser cold be upgraded to a 200 LED laser circuit with a reverse forward LED sequencing effect. LED light chaser circuit typically refers to an electronic configuration able to generate or illuminate a group of LEDs in some predetermined sequence. 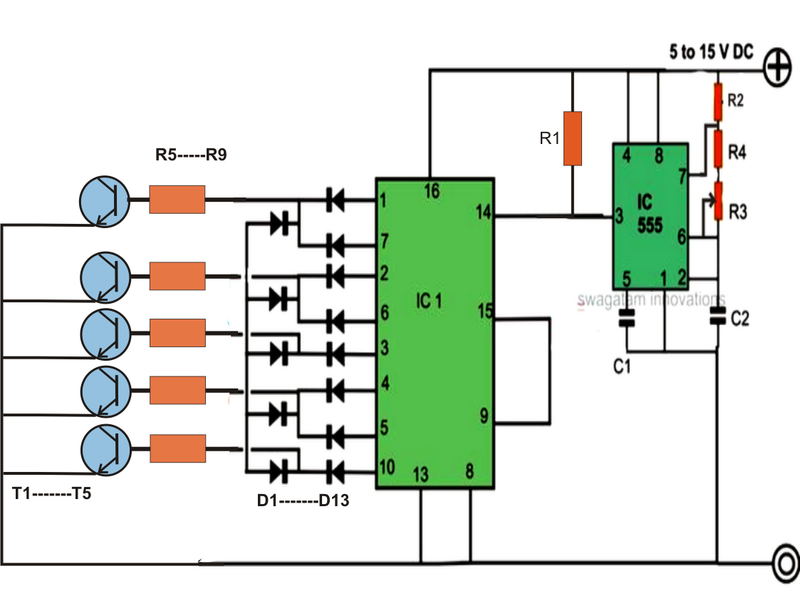 One popular IC 4017 is very commonly employed for making this type LED sequencer circuit. The IC basically is a Johnson's 10 stage decade counter/divider and can be used for many interesting light pattern generations, and may be used for various decorative purposes. We all have probably learned a lot regarding circuits using the above IC for producing chasing light effects, however making the IC create "reverse" "forward" "chasing" pattern with LEDs is something many of us might not be acquainted with.Here we will learn how to make a simple yet effective to and fro or reverse forward light chaser circuit using LEDs. But before that let's take a brief look at the IC 4017 pin out details. The IC 4017 is a 16 pin dual in line (DIN) IC. Pin 16 is the positive supply input, pin 8 is the negative supply input or the ground line. Pin 13 is used clock inhibit inhibit and will stall the circuit if connected to positive supply terminal, however connecting it to ground makes everything normal, so we connect it to ground. Pin 12 is the clock carry out, not required for single 4017a applications, so we leave it open. Pin 15 is the reset pin, and it resets the output to the start pin in response to a positive response to it. The pin 15 of the IC is connected to the second last pin 9 of the IC, which means the output resets every-time the sequencing reaches pin 9m,and the moment this pin goes high, the IC repeats the action by resetting the system. Pin 14 is the clock input and requires to be fed with a square wave frequency, easy obtainable through any astable oscillator made from ICs like IC 555, IC 4049, transistors etc. Looking at the shown reverse forward LED light chaser circuit, we see that basically the IC is arranged in its normal sequencing or chasing mode, however the clever introduction of the diodes at the outputs of the IC make the sequencing appear to be reversing and forwarding from start to finish and vice versa. The smart arrangement of the diodes enables the output sequence of the IC to feed the LEDs in a way that the relevant LeDs are able to imitate a to and fro chasing pattern. This is achieved by by forcing 5 outputs to move in a forward chasing pattern, while the following 5 outputs are redirected toward the same LEDs but in the opposite direction, making the pattern look like a to and fro chasing motion. In the above example we have seen how a reverse forward LED sequencing may ge implemented over 5 LEDs, however in order to get a more interesting effect we would want to increase the number of LED to higher numbers so that the illumination increases and the visual effect is able to get much enhanced. The following section will explain how this may be accomplished using 200 LEDs, however any number of LED could be used just by modifying the transistors and the series parallel connections for the LEDs, let's learn the details. The circuit diagram shows a simple yet an effective configuration which is able handle up to 200 different colored LEDs and create the required to and fro chasing show. The IC 4017 is the main part of the entire system whose outputs have been very cleverly manipulated using diodes. Normally, in response to a clock signal the outputs of a 4017 IC would begin shifting sequentially from pin#3 to pin#11 covering ten of its pin outs in a certain random order. If the LEDs are arranged in these ten outputs, one would acquire ordinary one direction sequencing of the LEDs. In the discussed circuit, five of the end sequence pin outs have been diverted in such way that the connected LEDs produce a to and fro moving effect, however with this arrangement the total number of outputs get restricted to only 5, nevertheless sufficient for implementing the intriguing visuals. Normally the outputs would accommodate a maximum of 4 LEDs, a total of 20 numbers. For handling as high 200 LEDs, transistor buffer stages have been included in the circuity. Each transistor or the channel can hold upto 50 LEDs, the LEDs are connected in series and parallel combination as shown in the last diagram. The LEDs are connected to the collector of the respective transistors as referred to in the last diagram. The IC 555 is wired up as an astable for generating the required clock pulses at the input pin#14 of IC 4017. These clocks determines the sequencing rate of the connected LEDs which may varied by adjusting variable resistor R3. The circuit may be powered from a 12V battery or a 12V/3amp SMPS adapter unit. The following diagram illustrates the connection arrangement of the LEDs to the above circuit. A single series for each channel has been shown in the diagram. The numbers can be simply increased just by inserting more such series in parallel to the respective strings of the different channels. LED resistors are = 150 Ohms 1/4 watt. How to pause the clock pulse in 555 output.. Please tell it detailed sir..
first connect pin#4 with the positive line through a 1K resistor, after this is done you can prefer to connect the pin#4 via a switch with the ground line whenever pausing is felt necessary. But I think it is better to modify the IC 4017 connections than the IC555, for this the pin#13 of 4017 could be connected to ground through a 1K resistor, and next the same pin could be connected to the positive line through a switch whenever pausing of the output sequence is felt necessary. are you intending to reduce the PWM to 50% so that a modified output could be achieved? if yes then a 6-0-6 trafo can be tried (with equivalently higher current rating). I have built it and it’s work as explained thank very you much and keep up the good work God bless you! I am glad it is working for you faith. Which one is 100K pot linear? R3/R4? What is the ratings of leds used in this circuit.? Hi Darshan, it will depend on your choice and requirement, you can include any type as per your desire. Hi I am Prasanta,my question is can i use 50 leds in this circuit in the place of 200 leds.If I have to make some changes in the circuit what should be those changes? Hi Prasanta, you don't have to make any changes in the main circuit, you just need to modify the series connections and the associated resistor values as per the second diagram. 1.More then 1000 led we can use TIP122 5AMPS TRANSISTOR..is it possible ? 2.Ac Bulb 70watts i want use with circuit….total 100 bulb using..each channel 10 bulb..totally 4017 contains 10 channel so 100 bulbs using….the output switching devices what i want to use…now I'm using Relay and check its working well….but not good….without relay what i can use ,whether TRIAC,SCR,MOSFET,TRANSISTOR….. I need u r help sir.. Sorry sir i have wrongly posted my request on "Knight Rider LED Chaser Circuit, Mains Operated Transformerless – Diwali, Christmas Project" actually i want 3 channel sequencely running diagram of above circuits. Please provide if possible. disconnect pin#15 from the ground line and connect it with pin#7…and then use pin#3/2/4 for illuminating the LEDs in sequence. ohh sorry my bad, its pin 8 not 0. The input supply is 12VDC, I am suspecting something wrong in the pin 15 configuration wrt. resetting the IC upon start and pin 1 high given to pin 15. Can you review the configurations or let know the ideal way of doing the reset upon power on. I can see in the above configuration how pin 9 is doing reset however could not get it to work in my case. PS: According to my observation, the IC gives up as soon as I connect pin 1 to pin 15.
for switch-ON reset connect the pin15 with any other desired output pin through a 10K resistor or any other high value resistor…and connect a 0.1uF or a 0.22uF capacitor across positive line and pin15…..
Sir, I sent you a circuit diagram link. If it is made by you ,please tells me how I connect 200 in a series connection. I am not sure which circuit you are referring to? please indicate in my website only don’t send external links. and please do it as per instructions only, otherwise you will fail to succeed…. actually I want this type of rope light. Can I change this circuit in to rope chasing light for 100 fit. How can I change it. Please update the above diagram at least one led connection.i don’t know how to connect LEDs with transistor. Can I connect ic 4017 pin corresponding assignment? Rabindra, the LED connection details is already shown in the second diagram. Sir ,how can I dessin a PCB circuit board.which web site is easyly made a PCB dessin. How I know the pin number of ic 4017.the ic have 16 pins but you design only 14 pins. please connect them as shown in the diagram,..you can ignore the pins which are not shown, and leave them unconnected. No sir,I have only one doubt ,the transistor’s arrow side goes to negative (-)and another side goes to led or any other side. i am new in electronics,it is only my hobby.Please help me. Rabindra, the arrow sides are called emitters, you must learn all the basics first and then try building a circuit. anyway yes the emitters will go to the ground and the collectors to the LED cathodes. use 4 LEDs on each string and use 100 ohm as the series resistor. Reply me sir the previous post . the LEDs register are 150oms but which register are connected with transistor there values what. you can use 10K for the transistor bases, and use 100 ohms for the LEDs because you are using 4 in series. and initially use BC547 transistors, and for the LEDs use 20mA 5mA ordinary white LEDs. Can the above circuit work without transformer less circuit. If it possible, please give me a circuit diagram convert AC to DC. no, you will need a a transformer based power supply or an smps based power supply…. I am building a simple 50 led series for which I am using 555 timer to supply clock pulse to pin 14 of the 4017 IC. I want only five pulses so using output pin 0 through pin 4 and 5th pin is connected to reset pin of 4017. The problem I am facing here is IC overheating and eventually dying. Here is the pin configuration I am using. the supply should not be over 15V, preferably it should be 12V max. the LED stings must have a calculated series resistor, and ideally should be driven with a transistor…. if you maintain the above guidelines your circuit will work without issues. Which type of transformer I will use to convert DC on above circuit. you will need a step down transformer, 0-12V, current will depend on the total LED quantity. The above circuit and 200 LEDs can operate with 12v 3amp dc current,I think it is impossible.the right side of the circuit ( +) Sine mentioned (12v 3amp). Or there are two DC power supply require for connect to a circuit and another to 200 LEDs. Rabindra, go step wise, first build the IC 555 and 4017 section using 4 LEDs on each transistor, try to complete it successfully, after that you may proceed for the upgrades..
im just a fresher in electronics. ihave a doubt. in the circuit it have 5 transistors.can i connect a series of 40 leds to a single transistor? the circuit only have 5 channels ,how to increase the channels? im looking for a circuit which possible to connect 100 channels ,each have 40 led in series.pls help me. 100 channel is not possible because this design supports the reverse forward action only across 5 channels. For increasing the number of LEDs on each channel you can simply go on repeating the LED strings, for example for the red LEDs we can see 4 LEDs connected in series with one resistor, so you can add 10 more such strings in parallel for getting the 40 LEDs on that channel. is this circuit suitable for 220v AC input and 10pcs, 5 meter Chinese rice light??? if not plz share the circuit for 20 channel AC input. the circuit is good.but i want to make a circuit which run on ac outlet.and also without transformer..
sir can you design a led chaser circuit which run on direct ac and minimum 200 number of led.and also take small space..
one more thing sir many time i search on google that how china make such a chip led changer circuit with sum low cost. do you have any idea about that? please answer. you can use a 12V 5 amp SMPS adapter for driving the above circuit for getting compactness and saving space. 12v 5 amp adapter is bigger in size.and cost effective..is there any other circuit which take small space and low cost?of can any led chaser circuit are there which run direct on ac? Just only one prob. Please help…. Wheather the ckt. Input is 12v/3amp. Or I have to use two diff. source. if we replace the transistor with BC 547, then how many LEDs we can connect to each string? i got an idea sir…. according to it only two ICs are enough…. but before making that into practical could you please suggest how to increase the turn off time of each LEDs connected to the CD4017 IC ??…. first LED ( pin#3 ) should be ON for only 1 S…..after that 1 s of gap shoulb be there to turn the SECOND LED ON ( pin#2 )…. ovor in other words….. all LEDs should have an ON time of 1 S…. and an every particular LED should be turnede on 1 S ofafter the previous LED had ip off….. a time lag of 1 S should be there between the ON time of all successive LEDs…. also tell me sir how to vary frequency of output signal in each output pin of CD4017 separately utilizing only a single 555 IC…. AND HOW TO INCREASE THE TURN OFF TIME OF LEDs connected at these 10 output terminals ?? i need to turn an LED in first pin ON for 1 s then turned off …after two seconds next LED should be turned on…..similiarly others…. Can it be done changing mark space ratio of the signal given by 555s stage ??? so any other means exist to control all LEDs in a particular orbit separately from others using least no. of connections ?? in each orbital path LEDs should be arranged in such a way that one LED should blink after the previous one…one after the other….not all simultaneously…..
if i am gonna use a method similar to the current project in thz blog, i will have to use 8 separate CD4017 ICs and their associated components…..
so is there any such method exists to blink series connected LEDs one after the previous onepl, transfering light from the initial LED to the final one ??? r also….. i need an arrangement like this.. BUT THE MAIN REQUIREMENT IS the speed of sequencing of light in an orbit should have to be different from others. the speed of the LEDs on each channel can be set as desired by appropriately adjusting the relevant frequency determining components of the 555 IC. Can I connect 200 pic emitting diode led any colour on above circuit diagram. I want this circuit works on 220 ac directly. Can I connect a extra circuit , which is convert 220 AC to 12 DC. Give me a circuit diagram which convert AC to DC. you an connect any color 200 LEDs on each transistor by suitably calculating the series parallel numbers and the resistor values. make sure each LED has its own 1k limiting resistor. I am trying to make a om circuit diagram for Diwali purpose. I am a beginners in electronic. Can you please help me out on this. Can you send me a circuit diagram and required parts for led chaser for 150-200 LED's. My E-Mail ID is sukhsagar1982@gmail.com. Hello Vaibhav, make the first circuit that's shown above, after completing it it's just about connect LEDs in series across the collector and positive of each transistor. First build and complete the first circuit then I'll explain how to proceed. Sir I am new in electronics. Please send me circuit diagram of this & parts. I cannot understand the above circuit diagram.Please help me out . Everything's clearly given in the schematic, just click it to enlarge it. You can mention the things that you are not able to understand, I'll try to clarify them. Sure, thank you will try this, but it would be great if you could send me the diagram though. Wish you too a Happy new year! I would like to have this circuit of the forward and reverse sequence triggered through an IR LED/ detector for one cycle, the idea is…if a person passes in front of the circuit, it triggers off one cycle and goes off. it would be necessary to house the IR & detector at the same source too…Is it possible to incorporate this in addition to the above circuit? Please do let me know if you have something worked out already in your archive. it can be done by adding a BC547 transistor to pin13 of the IC, collector to pin13, emitter to ground…also a resistor of 10k goes from collector to positive, base of the transistor can then be fed with the IR pulse via a 10k resistor, this 10k resistor/ir pulse junction should be attached with a capacitor so that even after the pulse is removed the reverse forward continues….select the cap value to restrict the timing for just one cycle approximately. Thank you so much for your input, since I am a novice at this, ( infact I assembled the above circuit like a lego game without understanding the details 🙂 pardon my ignorance) could you suggest a range for the cap value please…or better still if you could share with me a schematic of your recommendation of the above, it would be great. The cap value will be a matter of experimentation because I'm not sure what value would result in an exact one reverse forward cycle, you can start with 10uF/25V, and check the results ad accordingly either increase the value or decrease the value until some reasonable value is achieved. If i get time i'll surely try to send you the diagram, however if you do exactly as mentioned in the above comment you would surely succeed in getting the intending results. It can be risky and dangerous to use it here….an ac/dc adapter is always good. As you replied above by chainging the transisitor to TIP122 can i use 2000 led.. Without any alternation in the remaining circuit including the power supply…? If possible then how many led can be placed in one branch…? TIP122 can handle upto 200 leds (5mm), for 2000 leds you may have to use 2N3055 transistors or 10amp mosfets….I have shown the number of leds tha could be accomodated on each branch depending on the color type, you can add more such strings in parallel for increasing the quantity to any extent. You can use the same circuit as described above….with an 12V AC/DC adapter for powering the circuit. if you want to use 12V then a common supply can be used. LEDs will depend on the supply votage and type of LED. just type "knight rider" in the above search box you'll find the required circuit…. Actually I am asking for circuit which use Traic instead of relay. the fading effect will work only for LEDs, not with triacs, so it won't be of any use. Sir is this circuit is right as per your previous answer.. In the circuit instead of one, connect two resistors at the base of each transistors (1k+1k) and connect a 10uF capacitors across the junction of the resistor and ground, this will produce the required fading effect. using 4017 the led will go on and off .how to make led lit up and lit down slowly, as you saw in Diwali(chinese made) flickering LED. solid state relay would be costly yes, but it will work flawlessly.